It’s February and I am surrounded by love and romance. 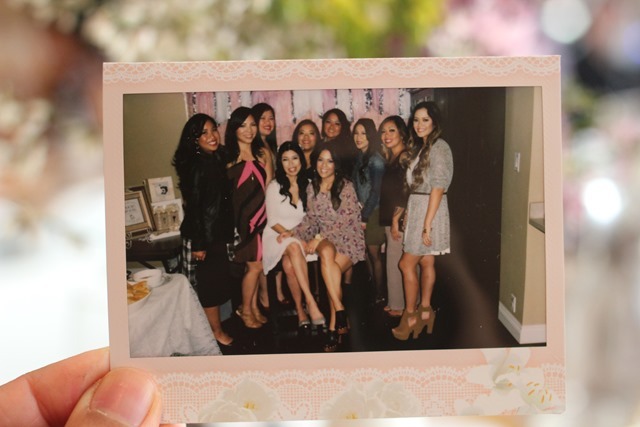 Amy’s bridal shower was this past weekend and the celebration was beautiful. What made it extra special was the reunion among all my closest high school friends, a few travelled from San Francisco and Hawaii. Reunited and it felt so good. We’ve all known each other since freshman in high school and have been part of each others live thru major events and milestones and it was pleasure to celebrate Amy and her upcoming wedding. Amy loves my bake goods and always supports me when I have my bake sales for fundraising. I offered to make a few treats for her bridal shower, something delicious but also pretty. 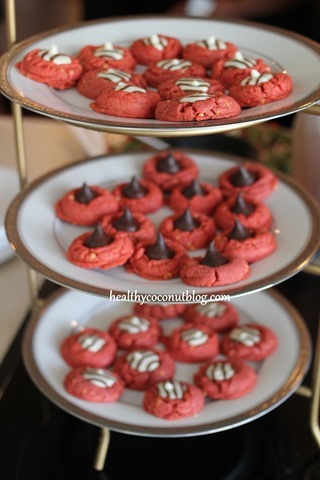 These peanut butter cookies with hershey kiss chocolate on top turned out really pretty, and because they were dyed a pink color, I would say they look romantic too. 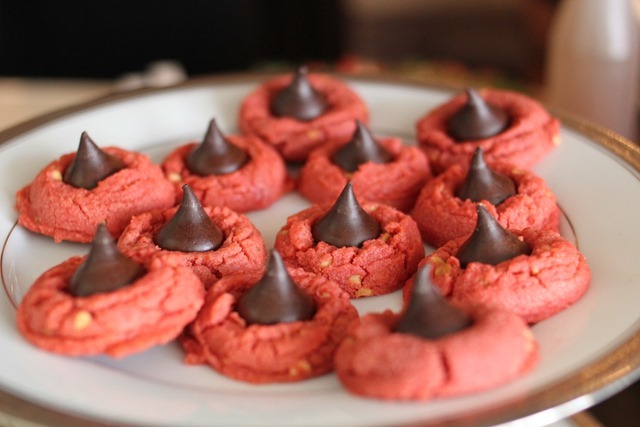 I might be making these again as Valentine’s day treats. In a mixing bowl, put the sugar, butter, and peanut butter together, mix on high speed for 4 minutes, or until the mixture is nice and fluffy. After that, use your kitchen mixer with the setting on low and slowly begin to add flour, two tablespoon at a time, and mixing until the flour is thoroughly combined. 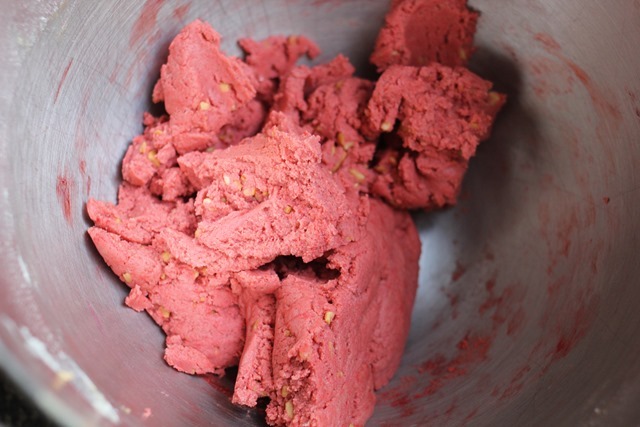 At this point, because my cookie dough was a little dry, I added 1 tablespoon milk and food coloring and continue mixing. 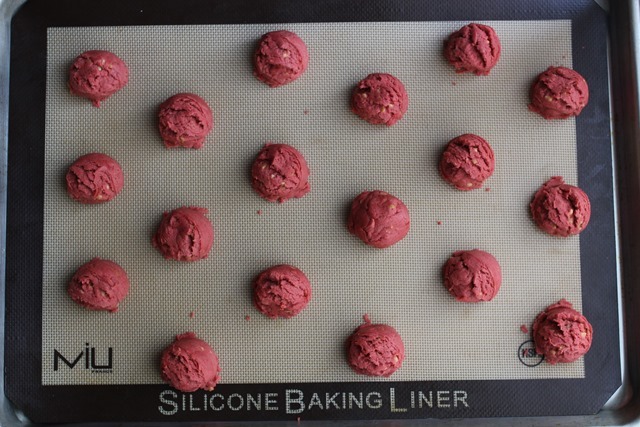 Take the dough out and form 1 to 1.5 inch diameter balls by rolling the mixture in the palms of your hands. 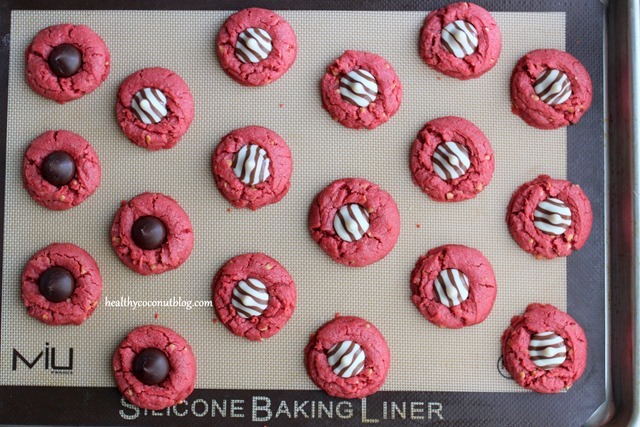 Put on the cookie sheet and bake for 8-10 minutes. 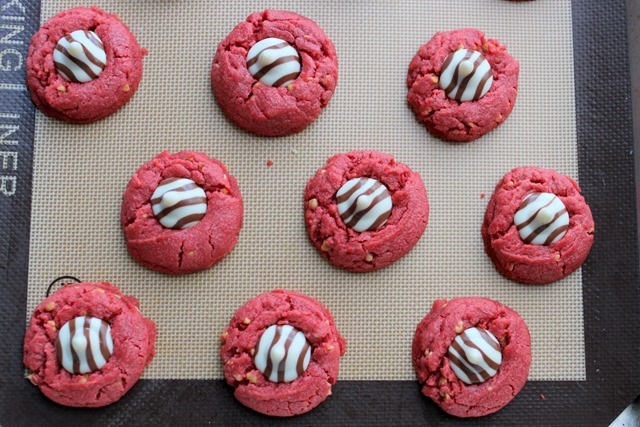 I used gel food coloring to tint the dough, 4 drops of red gel turned it into bright pink. I used a small cookie scooper and made sure the dough size were all the same. 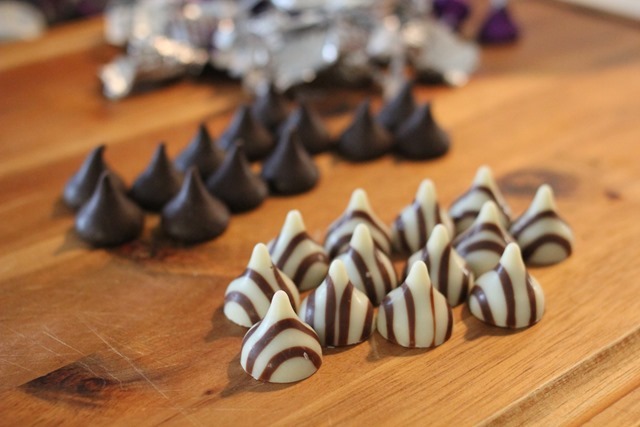 I used both milk chocolate and dark chocolate hershey kisses. I prefer dark chocolate always, but I know that majority of people like milk chocolate, so I used both. 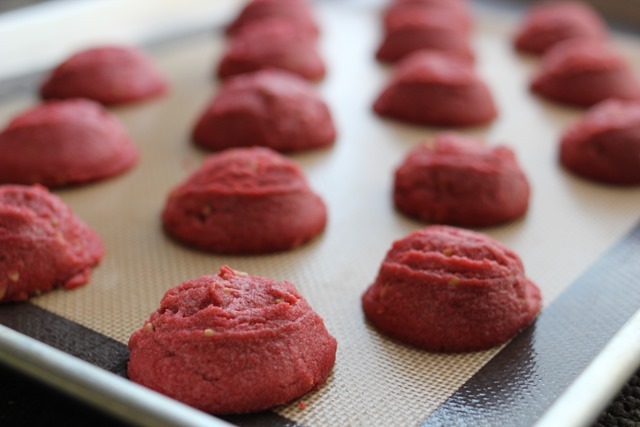 What the cookies looked like fresh out of the oven. 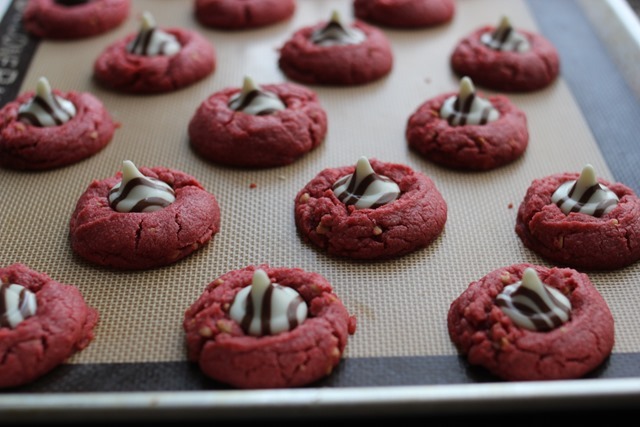 Wait a few minutes to cool the cookie, before adding the hershey kiss on top. I Lea! I’m a friend of Amy’s sister and I was at the party also 🙂 I loved your treats and was looking for the recipe for the Nutella mousse tarts. Can you post or email it to me? Would really appreciate it. THANKS!